This time of year is pretty darned fantastic. Our CSA box is stocked with greens that it make it really easy to pull together simple meals like the one pictured above. This is the meal we crave when we’ve eaten out a bit more than planned. This is the meal we eat when there has been more cheese in our meals than usual. This is the meal that brings our eating habits back in line after a weekend of busy. Luckily it can be pulled together in the amount of time it takes to cook the quinoa. Wrap tofu in a clean kitchen cloth and place something heavy (cookbook, large can) on it to press excess moisture out. Place quinoa and broth in a small saucepan. Cook over medium-low heat till broth is absorbed (about 20-25 minutes). 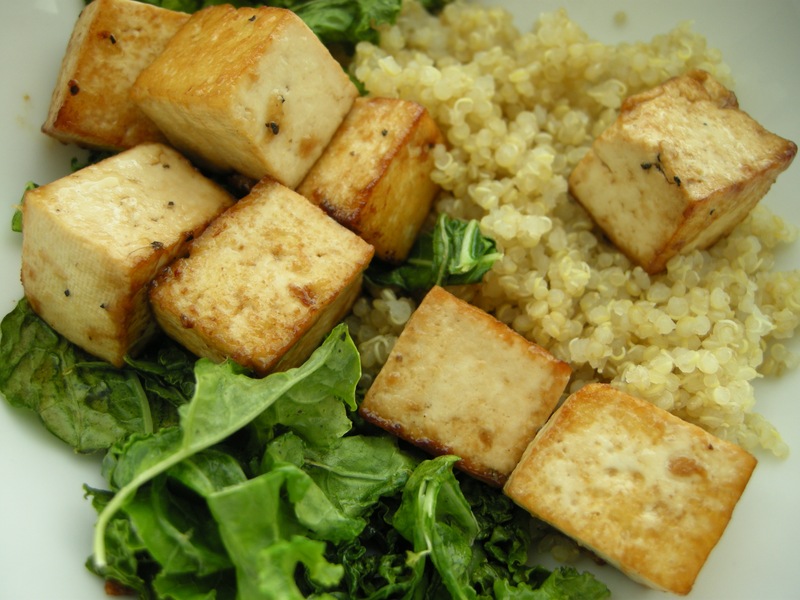 Continue with kale and tofu while quinoa cooks. Cut tofu block into cubes. Place soy sauce & pepper in a bowl and add cubed tofu. Toss till tofu is covered. Mix rice vinegar, corn starch and rice flour into a smaller bowl and mix well. Add to tofu mixture and toss until coated. Add sesame oil to a large frying pan and heat on medium-high. Add tofu once hot and brown on all sides. Remove from pan onto a clean kitchen rag to drain any excess oil. Add kale to same pan and lower heat to medium low. Cook until kale turns bright green. Add a dash of rice vinegar and salt to taste. Fluff quinoa with fork (once all broth has disappeared) and transfer to fine mesh colander to keep it from getting all sticky and gooey. Serve in bowls with a little soy sauce or, our favorite, Cashew-Tamari Dressing from Wheatsville. * I like kale because its stays relatively firm through the light cook I give it, but collards or chard work, too, if that’s what you have on hand. the corn starch and flour right before frying gives it an extra layer of crispy that we love. hope you enjoy it!